Each year, Heritage 5th grade teacher Mrs. Coughlin coordinates “Take a Veteran to School Day.” She has connected with local veterans who come into her classroom each year to teach her students about the United States, freedom, patriotism and service to our country. This year the event was held on October 11th and took on special meaning for us as a school district and for Mrs. Coughlin specifically. We welcomed back Saline alum and Mrs. Coughlin’s son Ensign Patrick Coughlin who is currently serving in the U.S. Navy aboard the USS New Hampshire. 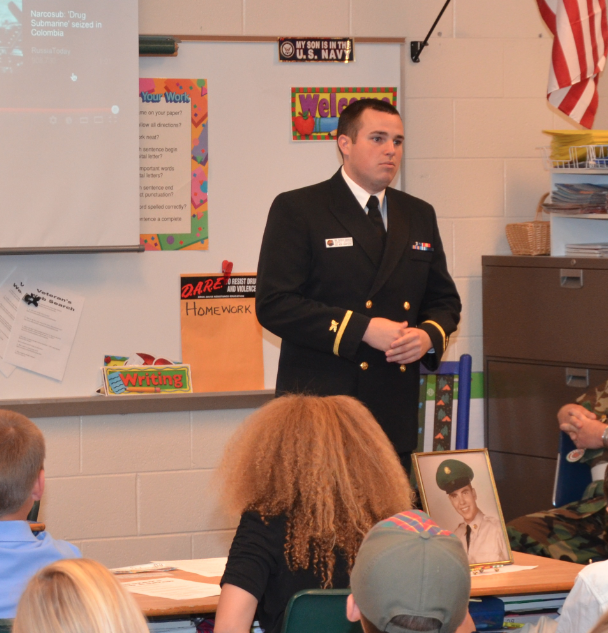 It was an outstanding event that connected our students with veterans and allowed them to share what they have been learning in school about patriotism and military service. We also celebrated a letter writing project where Mrs. Coughlin’s class from last year had written over 150 letters to the serviceman on the USS New Hampshire during their 6 month deployment.